OUR EMBRYO TRANSFER FOALS ON ARE THE GROUND! Embryo transfer has many advantages. 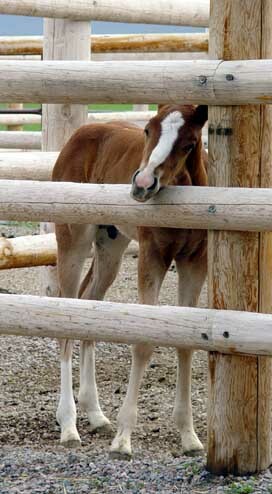 It allows the production of foals from older sub-fertile mares. With embryo transfer, your performance mares can produce foals while they are still in training. 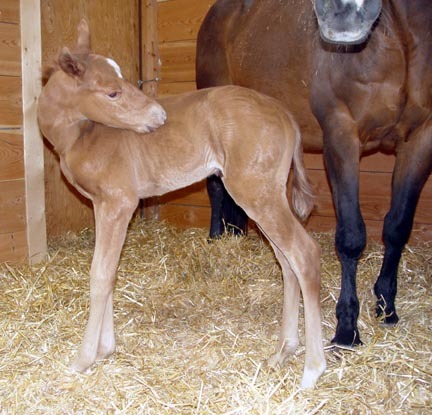 Your valuable mare is able to reproduce many more foals than possible through traditional breeding. It gives you the option of more than one foal from a single mare in a given year. while they are still in training. Embryo Transfer is the process of removing an embryo (a fertilized egg) from a broodmare and placing it in a surrogate mare where it develops into a foal. The process is comparable to artificial insemination (AI), which uses superior sperm of a stallion to reproduce quality foals. Because of technology and a different standard of breeding rules, AQHA registered mares can sometimes pull double-duty in the breeding shed and on the racetrack. 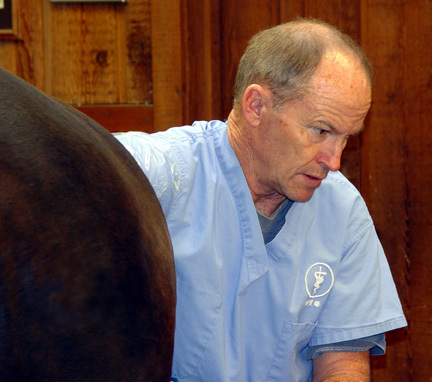 Embryo Transfer is outlawed by The Jockey Club in registering Thoroughbreds. 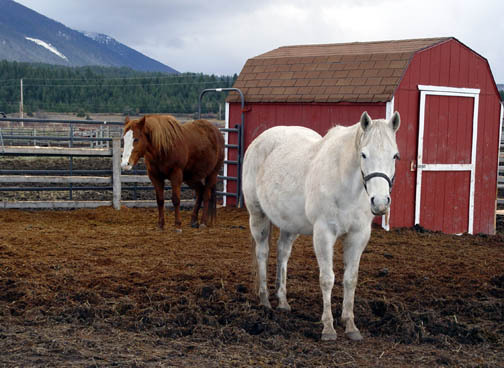 American Quarter Horse mares and Thoroughbred mares booked to a Quarter Horse stallion however, can be bred and returned to the racetrack to continue training and racing following the successful transfer of her embryo to a surrogate mare or recipient mare. 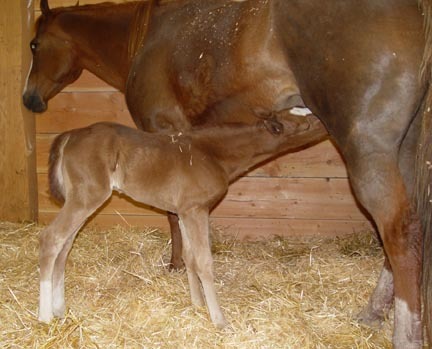 The Embryo Transfer begins with breeding the donor mare (the mare "donating" the embryo). Bred as usual, she is monitored with daily ultrasounds to establish the exact ovulation date, the date her egg is released. On a synchronized schedule, Veterinary Services also monitors by ultrasound the recipient mares (the mares potentially "receiving" the embryo) looking for one mare whose reproductive cycle matches the donor mare's. It is very important that the estrus cycles be at the same point for a successful transfer to take place. Estrus detection is crucial to the process. Seven Days after the ovulation date, the donor mare's uterus is flushed. The fluid from her uterus is run through a special filter cup designed to catch the embryo. A transferable embryo is between the ages of 6 and 8 days old. At 5 days old, the embryo has not yet entered the mare's uterus and cannot be flushed. At 9 days old, the embryo is too large and fragile to handle. Flushing on day seven maximizes the chance of recovering an embryo of ideal transfer age. The flushed fluid is thoroughly searched for an embryo under a microscope. A 7-day-old embryo is approximately ¼ to ¾ millimeters in size. It is visible to the naked eye if you know where it is. Precise care and preparation of embryo transfer equipment and media is crucial to the success of any embryo transfer program. Genetically intact at recovery, the embryo contains all the genetic material it needs for its own development as well as for the placenta's development. The recipient mare provides nutrition with no direct blood transfer. After the transfer, the recipient's new pregnancy can be seen by ultrasound within one week. Her uterus carries the donor mare's embryo naturally. When the mare foals the following year, she raises the genetically unrelated foal as her own. Veterinary Services recommends at least two recipients per donor mare in case one of the recipients fails to have a normal cycle. Recipients can be provided by the donor mare owner. However, the recipients must undergo a breeding soundness exam to determine if they are suitable for the program. The use of young recipient mares or mares of known fertility are encouraged. Call Dr. Hoversland and discuss the reasonable costs of embryo transfer (406) 676-0090.